Chrichton's World: Review Taken (2008): If Neeson says he is going to hunt you down and kill you then that is exactly what's going to happen! Review Taken (2008): If Neeson says he is going to hunt you down and kill you then that is exactly what's going to happen! Brian Mills (Liam Neeson) seems like an ordinary father who is trying to reconnect with his daughter until disaster strikes and he is forced to get into action and do what he does best. Mills might be many things but being ordinary isn't one of them. Mills retired from the CIA so that he could spend more time with his estranged daughter. The daughter named Kim is played by Maggie Grace and is being raised by her mother Lenore (Famke Janssen) and her current husband Stuart (Xander Berkely). Stuart is an extremely rich man and has spoilt Kim. It is implied he doesn't do this out of love but to make him look like a better father. Yes like giving a child whatever they want is a good quality. Although it's Lenore who is the biggest culprit. She is taking out her grievances concerning Mills and their failed relationship all on him. And sure she might have had a valid reason while they were married that doesn't mean she can still hold that against him when he is actively trying to make up for not being there. Especially when he expresses concern about their daughter travelling to Paris with a friend and very little supervision. Any sane parent would and should be worried. And I thought his remarks on them living in a bubble were spot on. The world is not a nice place and one should always be cautious. He even suggests to keep an eye of them promising not to interfere with their activities. Well, I know that may sound like he is being a little overprotective. Still as it turns out he was right to be afraid since daughter Kim and Lenore have lied about the real plans. Indirectly it's Lenore who put her own daughter in danger. When Mills who is incredibly worried about his daughter finally gets to speak to her, the abduction of the two girls is taking place. That leads to the famous scene and dialogue of him having a particular set of skills and more. The second he says these things he has this look in his eyes you know he is going to follow through on what he has said. He already gave a little demonstration of his skills when playing bodyguard for another spoiled brat played by Holly Valance. Once in Paris he really doesn't waste time to do what's needed. It is such a joy to see Neeson break bones and kill people like it's nothing. To be fair he did ask for help but was denied. Like any father would just give up on his beloved daughter when requested. Mills has out sympathy right from the start. We don't care that he is deadly. Actually we like him for being so effective since all the people involved deserved it. 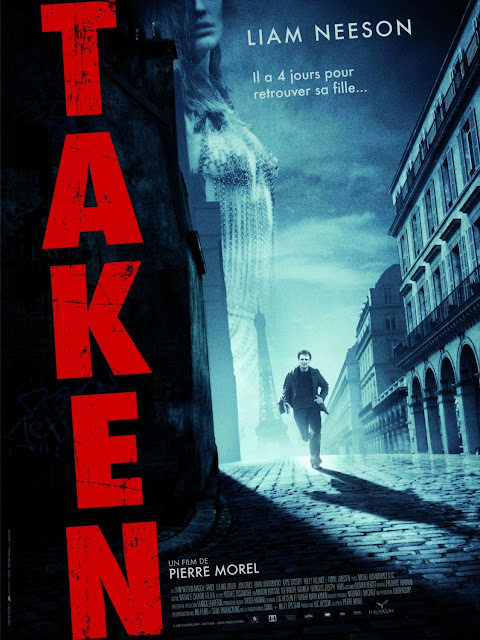 Taken is an action classic that can be enjoyed over and over again because of the emotional component and the excellent Liam Neeson.